The Higgs boson isn’t really a ‘thing’ in the way that a non-particle physicist might understand the term. How do physicists ‘see’ it, and how do they negotiate its public image? In 2013, the discovery of the Higgs boson at CERN (the European Organization for Nuclear Research) caused an international press frenzy. Magazines and newspapers published dozens of stunning images to illustrate the news of the discovery to a general audience. 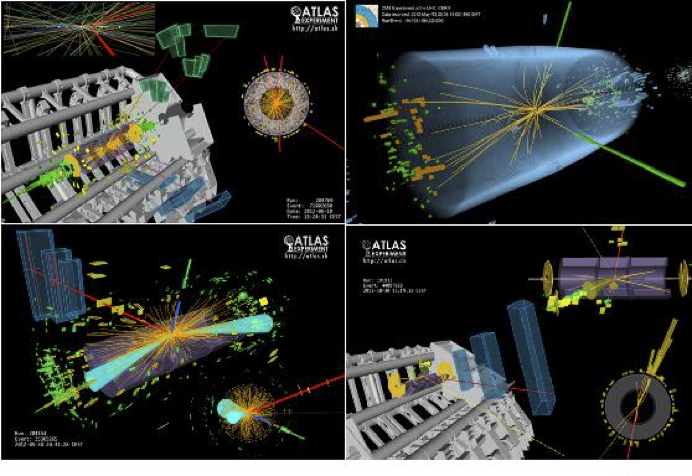 But there was one important problem: none of these images really displayed the Higgs boson. The problem boils down to a situation that’s pervasive across science communication, which often relies on images to illustrate and represent complex scientific concepts. Images are powerful tools: they can attract people’s attention and provide intuitive truth much more easily than words can. The twisted ladder of DNA has become a symbol of the life sciences and life itself. Images of Earth from space, with its recognizable blue oceans, green continents, and swirly white clouds, represent our home planet, and have become powerful symbols for environmental stewardship. But, in seeing these as scientific, we tend to forget that these images are also social products, deliberately manipulated to convey a story or a subjective opinion—and often reflect the vision and culture of the scientific community. A lot of invisible work goes into turning scientific data into visualizations for public consumption. Most images of a blue marble-like Earth aren’t captured by a single camera shot. They’re patchworks—mosaics fabricated by NASA from numerous photos of small parts of the Earth. If the Earth is too big for a single photograph, DNA is much too small for photographic treatment. Instead, visual artists and designers create images of the iconic double helix, selling them to multimedia companies as stock photos. The resemblance between an image and reality is actually a product of imagination. Images bound with scientific discourses and activities are not unbiased records of natural phenomena, but are instead artifacts and commodities representing—and often selling—certain ideas about nature. In the case of the Higgs boson, while the audience expects to ‘see’ the physical form of the particle, this search is in vain. As the particle physicist points out, it is impossible to actually visualize the subatomic particles. But what do these images mean without an observable Higgs boson? How do they do the work of science communication? Why do science communicators produce such images for the public—and are these images useful inside the scientific community as well? On the press preview day of the Collider exhibition in the Science Museum London, a journalist asked Peter Higgs about how he himself visualizes the Higgs boson. Higgs responded that he doesn’t visualize it at all. That’s because the Higgs boson isn’t really a ‘thing’ in the way that a non-particle physicist might understand the term. Rather, it is a perturbation, a ripple in an energy field. In 1964, Peter Higgs proposed that fundamental particles get their mass by interacting with an ever-present energy field. To prove the existence of the Higgs field, it has to be excited to create detectable ripples. If the Higgs field is an invisible sea, the Higgs boson is a wave on the surface that requires very expensive equipment to be able to ‘see’. It took almost fifty years and many billions of dollars to prove that this field and this mass-giving mechanism exist, because it’s extremely difficult to produce these ripples—the Higgs boson—inside the Large Hadron Collider (LHC). And once it appears, it decays immediately, so particle physicists can only record the footprint of the collision. By analyzing the decay of this footprint, the physicists were able to infer that the Higgs field exists. But the journalist’s question to the particle physicist was far from naïve. It demonstrates the challenge of understanding the details of particle physics without knowing the language, assumptions, and methods of the discipline. And, importantly, it also reflects how often the Higgs boson is strategically—and incorrectly—visualized to explain and represent the field’s knowledge. This is what science writers Jack Cohen and Ian Stewart have referred to as the ‘lie-to-children.’ To help make the leap from the LHC to the public, science communicators use sensational images and employ active verbs like ‘hunt’ and ‘look for’ to attract the lay audience’s attention to this otherwise obscure subject matter. The metaphor of a seeable and chaseable boson is intended as the first rung on the knowledge ladder for more engagement and interaction with the public. When I interviewed Angelica she told me that the images she used in her presentation were produced after she and other particle physicists found the evidence to prove the existence of the Higgs boson. The images therefore weren’t useful evidence for the particle physicists at all. They were created entirely to serve the purposes of public communication. When creating these images, numeric information in particular is deliberately eliminated to generate a ‘photograph-like’ feeling. The CERN scientists used different images in different contexts—referring to the statistical bars and charts to identify the evidence and to communicate the discovery within the scientific community, while showing the graphic images to a lay audience that they imagined as being afraid of numbers and complex physics. The PhD students in the laboratories are often the artists behind these representations for public consumption; they import the collision data into CERN’s self-developed graphics application, and select images that are sleek enough to be displayed. Once these images have been vetted by the the members of CERN, they are uploaded to CERN’s document server and are free for use by journalists and other science communicators worldwide. Despite the fact that these images are post-production artifacts, Angelica explains that these images can work as ‘photographs’ for a general audience, authentically reflecting what was happening during the experiments. Her idea reflects the widespread belief that photographs are representations of truth. In her public lectures, along with a basic introduction of particle physics, she uses the photograph-like images as an invitation to the lay audience to virtually witness the eureka moment of the Higgs boson discovery. In Leviathan and the Air-Pump: Hobbes, Boyle, and the Experimental Life, Steven Shapin and Simon Schaffer note the power of producing such ‘virtual witnessing’ technology. It has a literary and social function, and thus can transcend boundaries. It can travel from the experiment to the public sphere to multiply witnesses, beliefs, and—most importantly—trust. Images © Xavier Cortada (with the participation of physicist Pete Markowitz), “In search of the Higgs boson”, 2013. Beyond simple explanation, these photograph-like images provide the flexibility and mobility for further interpretation outside of the particle physics community, for example in enabling artists and designers to add on ‘more’ layers of aesthetics and imagination to the discovery of the Higgs boson. Particle physicists and museum curators work closely with artists and designers in order to generate an emotional path for the lay public to care about basic scientific research. When working to stimulate public engagement with particle physics, public communication practitioners use aesthetic tools to provide embodied experiences, rather than simply displaying or representing scientific evidence. In studying the images of the discovery of the Higgs boson used in public communication settings alongside their cross-boundary trajectories, I found that scientific fidelity was not the priority. Instead, both the photograph-like images and the artistic images are stylish representations; they create culture while interpreting the culture of science. Often, they create representations that envision human progress in scientific research, and call for more support of the research. This creates a paradox: using low-information images to represent scientific authority can often be a strategic choice in science communication. Scientists, artists and public communicators add in colors, shapes, and imagination to make science more compelling. In this way, the Higgs boson—which decays a practically instantaneous 10-22 seconds after it’s created—has been turned into a space for creative visual representations. Its invisibility allows for the sensational and emotional work that follows. *because this article is drawn from research under human subjects protection, interview subjects have been given pseudonyms. Chihwei Yeh is a doctoral student in the Science Studies Division at the University of Edinburgh, interested in the social life of particle physics.